I am starting back to fiber work again. I didn’t stop completely. I get the occasional request for a baby blanket or a request fro help with a project. I stopped because it wasn’t fun anymore, not since Maus died. There was a time when I carried a project on me like some would carry their keys; I always had to have it with me. 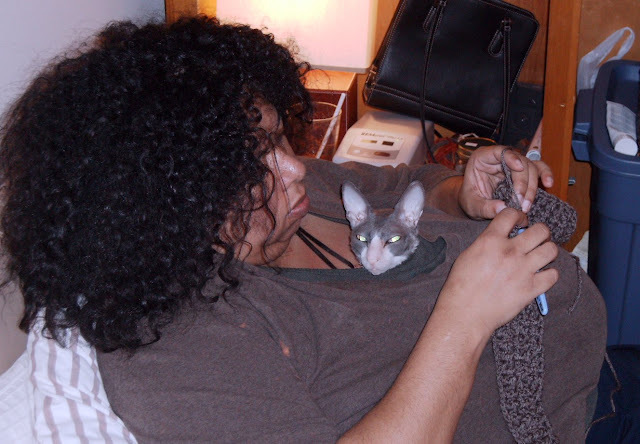 As I look back, I picked up crocheting again after not doing much of it since I was a kid about the same time I adopted Jake and Maus. Maus LOVED my yarn. She fetched runaway yarn balls and at times buried herself in bins. I had to watch Jake, he just loved to chew on it. I made clothes for Jake and Maus in those early days, and the craft, much like having the cats around was both fun and meditative. I do miss those moments, I miss them. It’s been a year for Jake and two for Maus and mourning for them has eased, and I feel I can pick up the yarn habit again. Though Moshe Moshi and Lexi Liu don’t share the Rexes fascination for my hobby, I’m sure I’ll love it just the same.